When it comes to science, too often people say "I just don't have the brains for it"--and leave it at that. Why is science so intimidating, and why do people let themselves feel this way? What makes one person a scientist and another disinclined even to learn how to read graphs? The idea that scientists are people who wear lab coats and are somehow smarter than the rest of us is a common, yet dangerous, misconception that puts science on an intimidating pedestal. How did science become so divorced from everyday experience? In Eureka, science popularizer Chad Orzel argues that even the people who are most forthright about hating science are doing science, often without even knowing it. Orzel shows that science is central to the human experience: every human can think like a scientist, and regularly does so in the course of everyday activities. The common misconception is that science is a body of (boring, abstract, often mathematical) facts. In truth, science is a process: Looking at the world, Thinking about what makes it work, Testing your mental model by comparing it to reality, and Telling others about your results--all things that people do daily. 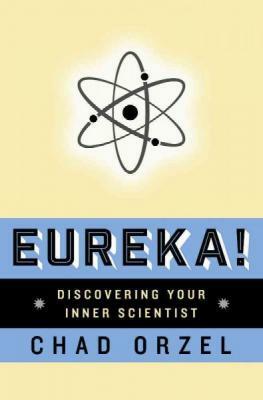 By revealing the connection between the everyday activities that people do--solving crossword puzzles, playing sports, or even watching mystery shows on television--and the processes used to make great scientific discoveries, Eureka shows that this process is one everybody uses regularly, and something that anyone can do. Chad Orzel received his BA in physics from Williams College, his Ph.D. in chemical physics from the University of Maryland, and held a postdoctoral fellowship at Yale University. He is a professor at Union College in Schenectady, New York and lives in Niskayuna, New York.